Self-Driving Cars Raise Questions About Who Carries Insurance : All Tech Considered Currently, insurance rates are calculated based on drivers' claims histories and driving records. Driverless cars are expected to shift the liability toward carmakers. But it won't happen all at once. Google self-driving cars are shown outside the Computer History Museum in Mountain View, Calif., in May 2014. An accident last month in Tempe, Ariz., involving a self-driving Uber car highlighted some novel new issues regarding fault and liability that experts say will come up more often as autonomous vehicles hit the road. And that will have an increasing impact on an insurance industry that so far has no road map for how to deal with the new technologies. Billionaire investor Warren Buffett, whose company, Berkshire Hathaway, owns the insurance giant Geico, told CNBC in a February interview: "If the day comes when a significant portion of the cars on the road are autonomous, it will hurt Geico's business very significantly." That would seem to make sense. If humans aren't driving the cars, who needs a car insurance policy? "It's certainly a topic of heavy conversation right now," says Rick Gorvett, staff actuary for the Casualty Actuarial Society, a trade group for people who analyze risk for insurance firms. Right now, insurance rates are calculated mostly based on attributes of drivers — their claims histories, driving records and such. Increasingly, some insurers also use apps or devices that allow them to track speeding and other behaviors. Insurers can then offer discounts as rewards for safe driving. A driverless car changes that model, shifting the insurance toward automakers, and away from drivers or car owners. It won't be a complete or immediate shift. 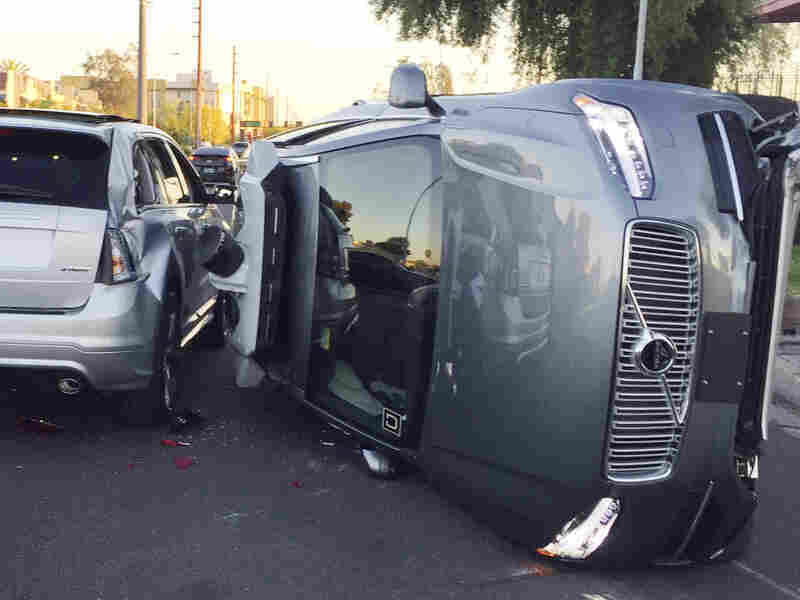 This March 24 photo provided by the Tempe, Ariz., Police Department shows an Uber self-driving SUV that flipped onto its side in a collision. Gorvett says the conventional wisdom — not yet backed up by a lot of actual data — is that autonomous vehicles will help reduce the human error that is the cause of the vast majority (90 percent or more) of accidents. In other words, automation will mean fewer accidents, but the accidents that do occur will more likely be the fault of machine, not man. "At least the current thinking is that the manufacturers will be ultimately responsible for a lot of these future accidents when an automated vehicle is involved," Gorvett says. How much that burden shifts is also a key question. James Lynch, chief actuary for the Insurance Information Institute, says if manufacturers have to bear the entire cost of insuring vehicles, that would create a huge, long-term expense. That, in turn, would create disincentives for the development of a technology that many believe will ultimately lead to safer roads, he says. "If you believe that the autonomous technology is going to be saving lives, then you would want [the automakers] to have some sort of a protection," Lynch says. So some states, which primarily regulate insurance, may have to hammer out their own standards. A recently passed Michigan law, for example, specifies an automaker assumes liability and insures every car in its fleet when driverless systems are at fault. In the U.K., Parliament is considering legislation specifying insurers should pay out claims in accidents relating to autonomous vehicles, though the insurers could recover those costs from automakers. Still, for many years, there will not be a large number of fully driverless cars on the road. So for the most part, says Bryant Walker Smith, a law professor at the University of South Carolina, fault and liability will be determined case by case, as happens after accidents now.
" 'Who was speeding? Was there a stop sign? What was the weather? Did the vehicle fail?' — and in the future, the same questions will be asked," Smith says, but the difference will be that the tech-savvy cars of the future will gather far more data to help determine fault. "Details of that will be worked out by courts in individual cases and those individual cases will provide the backdrop against which insurers start determining their exposure and then eventually the rates that they charge," he says. But for now, the technology is too new and there are no cases working their way through the court system. 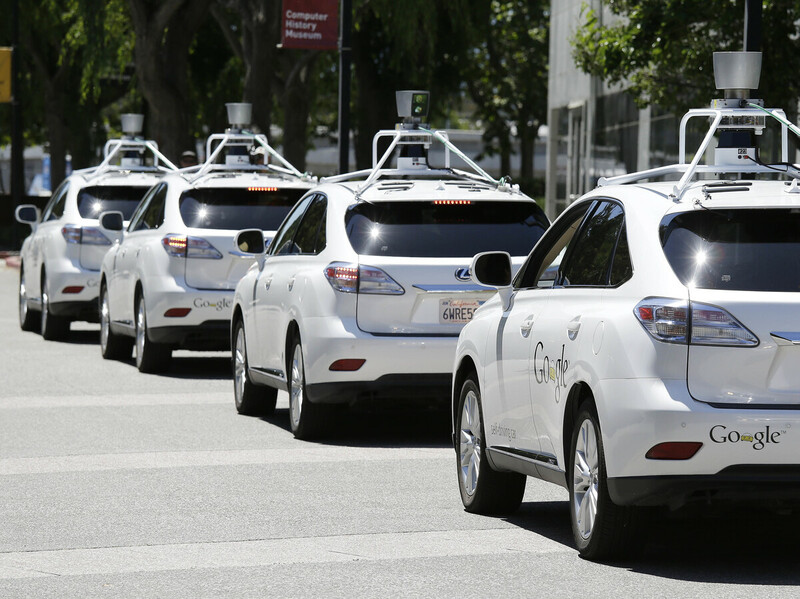 What Do Self-Driving Cars Mean For Auto Liability Insurance? Right now, Smith says, one of the biggest obstacles for insurers is a lack of data. "Insurance is a data-based effort to really predict the future based on the past, and when you have dramatically different technologies and new applications for automated driving, it makes predicting the future much harder because you don't have those reliable data about the past and present," he says. Ash Hassib, senior vice president and general manager of auto and home insurance for LexisNexis, says carmakers need to collect uniform safety information to enable more analysis on the performance of driverless cars. "There is no standard, and every manufacturer is going about this in a different way, so to try to normalize all these data sets from all these manufacturers is going to be of extreme importance," he says.